On Saturday May 31st, the Overte Foundation and Avacon have announced the Second Annual OpenSimulator Community Conference, with a press release on the announcement being circulated via e-mail on Tuesday June 3rd. The conference will take place on the OpenSimulator Conference Centre grid on November 8th and 9th, 2014. It will be a celebration of the platform and the large and varied community using it. As such, it will feature two days of talks and presentations across four tracks, keynote speakers, panels and social events. Anyone who is interested in the OpenSimulator software and the future of the metaverse is invited to attend, as well as OpenSimulator developers, grid administrators, and members of the community who participate on OpenSimulator grids. In addition, the conference will feature a new Learning Lab area. 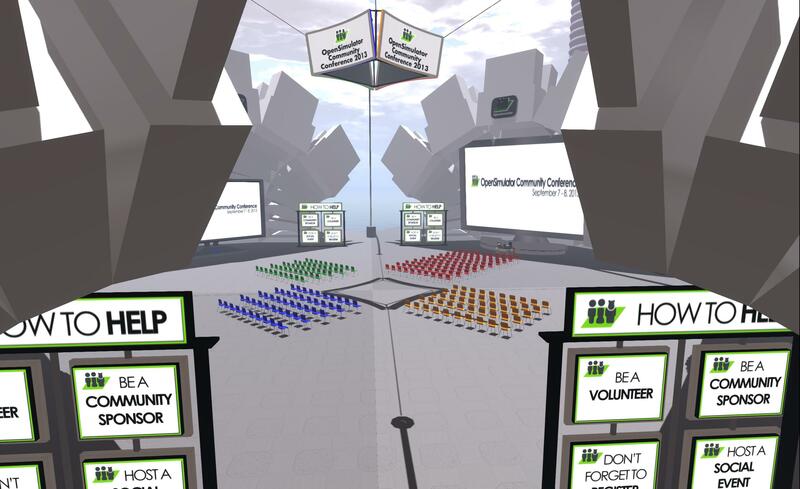 which will be available for hackerspaces, speed builds, and workshops for hands-on learning experiences guided by experts in the OpenSimulator community. The Call for Proposals for all four tracks and the Learning Lab is now open, and all proposals should be submitted by July 1st, 2014. Last year’s conference was a terrific success with over 350 attendees from 45 unique grids and over 1000+ commits to the core code, which made OpenSimulator a much more stable and scalable platform. This year we hope to build on that success by offering more opportunities for the community to be involved and doing more outreach to attract new users. With all the hype surrounding the Oculus Rift and other virtual reality technologies, we think this is the perfect time to let the VR community know that OpenSimulator is a great platform for building the open metaverse. Further information on the conference will be made available in due course – including details of keynote speakers, volunteer registrations, etc. Registrations will open on September 15th, 2014. While the conference is being held in virtual space, it does incur some expenses (such as the professionally managed set-up and operation of the conference grid and the streaming and other web services). As such, the organisers are seeking sponsorship from businesses, entrepreneurs, and community members alike to help support the conference through a range of sponsorship opportunities, which have this year been updated and revised to better meet the needs of sponsors. In addition, the conference is running a Crowdfunder Campaign to allow those wishing to make smaller donations to do so. Some unique rewards are on offer to those participating in the campaign, the full details of which can be found on the Crowdfunder Campaign page.